(Nanowerk News) By doping a thermoelectric material with minute amounts of sulfur, a team of researchers has found a new path to large improvements in the efficiency of materials for solid-state heating and cooling and waste energy recapture. This approach profoundly alters the electronic band structure of the material – bismuth telluride selenide — improving the so-called “figure of merit,” a ranking of a material’s performance that determines efficiency in applications and opening the door to advanced applications of thermoelectric materials to harvest waste heat from power plants to computer chips. By doping thermoelectric materials with minute amounts of sulfur, researchers have found a new approach to materials for solid-state heating and cooling, and waste energy recapture. Thermoelectric materials can convert a voltage to a thermal gradient – causing one side of a material to become hot or cold — and vice-versa. The efficiency with which a material is able to convert a voltage to a thermal gradient is mainly determined by the material’s figure of merit. 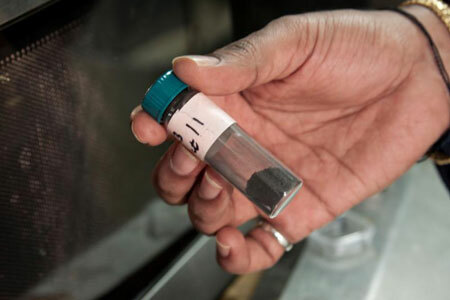 State-of-the-art thermoelectric materials are not very efficient, limiting their use to niche applications such as picnic refrigerators, domestic water heaters, car-seat climate control and night vision goggles. With substantial improvement in figure of merit, thermoelectric materials could be used for more advanced applications, such as harvesting waste heat in power plants and engines, and cooling computer chips. The figure of merit of a thermoelectric material depends on three properties: electrical conductivity – the ability of the material to conduct electrons; Seebeck coefficient – the ability to cross-convert electricity and heat; and thermal conductivity – the ability of the material to conduct heat. For a high figure of merit, a material would have high electrical conductivity, high Seebeck coefficient, and low thermal conductivity. One barrier to achieving high figure of merit is that electrical conductivity and Seebeck coefficient have an inverse relationship; one increases the other decreases. “The big challenge in generating power with thermoelectrics is how to get high voltage and low resistance at the same time. Our work shows a new and important way forward: we need to optimize this method and put it into practice,” said David Singh, a University of Missouri professor whose theoretical calculations provide a basis to explain the observed results in terms of complex changes in the electronic band structure shape. The research is detailed in the May 11, 2016, online issue of Advanced Materials ("Harnessing topological band effects in bismuth telluride selenide for large enhancements in thermoelectric properties through isovalent doping"). The work is a collaboration between researchers at Rensselaer, University of Missouri, and the Max Planck Institute for Solid State Research in Germany. For this work, Devender — the first author of the paper and a doctoral student of Ramanath — received a Norman Stoloff award for graduate research excellence by the Department of Materials Science and Engineering at Rensselaer. Devender currently works at GlobalFoundries Inc.
Ramanath’s research exemplifies the work being done at The New Polytechnic, addressing difficult and complex global challenges, the need for interdisciplinary and true collaboration, and the use of the latest tools and technologies, many of which are developed at Rensselaer. His research focuses on nanomaterials and interfaces for applications in electronics and energy. His investigations include the development of new types of bulk materials and thin films through directed synthesis and assembly, as well as the creation of molecularly tailored interfaces with novel or unique properties. Ramanath’s recent discoveries include a new class of thermoelectric nanomaterials — including this new variant of sulfur doped bismuth telluride selenide — built from assemblies of sculpted nanostructures for high-efficiency solid-state refrigeration and electricity harvesting from waste heat, along with nanomolecular layers of “nanoglue” that can join non-sticking materials, inhibit chemical intermixing, and boost thermal transport.